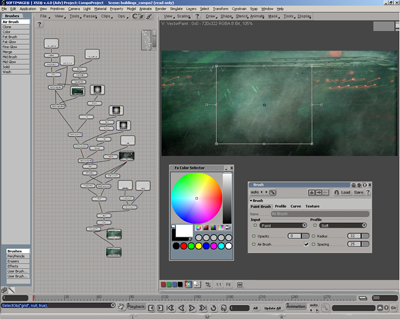 Softimage XSI 4.0 is promoted as the most significant upgrade to their venerable graphics package since version 1.0. Having used Softimage for a number of years I would agree that version 4.0 has a number of very significant feature upgrades that apply directly to game developers. Softimage XSI has always been pitched as a very high end (with the high end commensurate price point too) 3D animation package that is mostly used for film. 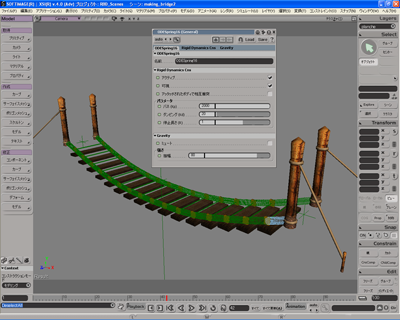 The tools in Maya and 3DS Max being more mature when it came to the vagaries of game development. Perhaps it was just my personal experience but wherever I looked in the game development industry, XSI was almost nowhere to be seen outside of boutique art houses using it for high-end cut scenes. The lack of exposure was caused mostly by the price point, but a lot had to do with Softimage completely ignoring game developers. It appears that the company is attempting to redress the balance with a more amenable pricing structure and a feature set to woo game developers. I’ve been a Softimage user for nearly 10 years, having formally trained on it using SGI Indigo hardware, before the release of the first XSI version so it’s a package that over the years has become as comfortable to me as Microsoft Developer Studio. I have a lot of history with this software and really know my way around it so I wasn’t expecting too much from a half-version release (I’ve been making use of v3.5 since November of 2003). According to Softimage, XSI v4.0 is the biggest update to the application since v1.0 was unleashed on the world and I find myself mostly agreeing with that claim. Different is good (this time). XSI v4.0 adds dozens of big new features. Far too many that can be covered in this review so I’ll concentrate on what’s important to game developers. Let’s start with the user interface. All your layouts and panels can now be customised, and most importantly, saved! The layout is actually saved as XML which is a nice feature. This is quite a departure from earlier versions, especially the early days where almost everything was nailed down and you couldn’t move it around. Along with the customisation aspects XSI adds a lot of workflow features, notably the concept of media shelves. Here you store all of the items you are using in a particular scene for quick access; models, textures, scripts, shaders, etc. The concept is that you reach up on the shelf and take down what you need for a particular part of the scene. This is one of those subtle interface changes that you never quite realised how handy it can be until you’ve used it. There is also a scene table of contents that lists all of the shaders, scripts, objects, textures, etc, in a human — and machine — readable form so that asset lists can be tracked, parsed, and manipulated. The days of having to use a low-resolution stand-in object when animating dozens of highly detailed objects that bring your machine to its knees even in wireframe mode are over. You now have the option of using low-resolution reference objects in place of the actual geometry. Finessing the workflow by naming a reference object and the actual object identically and then swapping one for the other (hoping that you got all the appropriate instances) when you wanted to do a final render is no longer the chore it was. XSI also applies the same idea to textures, utilising low-resolution proxy images that load faster and can be manipulated quickly when you’re blocking out the movement in a scene or tweaking a pose. The technique also applies to shadows, using low-resolution stand-ins for performing rapid lighting calculations on highly detailed objects. XSI adds a vector & raster painting tool that lets you paint directly on to textures, single frame or video allowing quick touch up work without resorting to an external art package such as Adobe Photoshop. The solution is reasonably robust and feature rich, especially for frame by frame tweaking that can be a real chore in other packages, but it is no Photoshop. Compositing has been overhauled with new tools for handling tracking & pinning along with an “Image Compare” window for side-by-side comparison of before & after images. XGS (XSI Graphic Sequencer) is Softimage’s new programmable graphics pipeline technology allowing adept programmers to implement custom rendering solutions that execute on the GPU for full scene and per-object effects. Rigid body dynamics using ODE. Softimage has done a lot of licensing of other technologies with this release, notably Open Dynamics Engine (ODE), an Open Source Rigid Body Physics solution used in a number of other commercial products, though XSI is the most high-profile application to date. Check out xpand rally to see this engine being used in a commercial game. ODE is implemented in XSI as a plug-in, so it’s possible to alter the source code, recompile, and distribute a new build to the artists within a team. 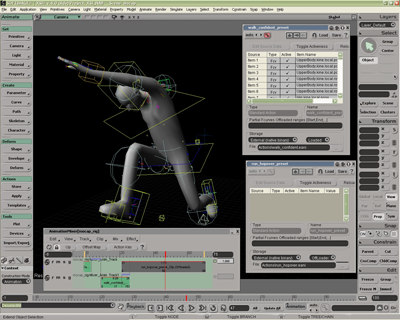 I can’t say whether Softimage has made use of a vanilla build of ODE, or tweaked it for their particular application. The particle system in 3.5 was capable, though it lacked many features that game developers deem desirable. XSI doesn’t disappoint, finally offering attractors and repulsors to influence the flight of particles, something that Softimage refers to as goals. The particle parameters, along with the emitters and goals are exportable and the entire particle system is exposed via an API that allows programmers to implement parts of the game engine to allow the artists to tune their particle systems for a particular implementation. Along with the standard Mental Ray renderer that XSI is known for you now receive several other options suitable for game development, the OpenGL renderer and DirectX 9 shader support is welcome and should prove useful for artists who will be building objects to run in a game engine. You can even apply a high-level shader language (HLSL) (tell your DirectX programmer colleague about it to give them ideas) to just a particular part of the scene. XSI adds further polygon reduction tools that are comparable to those found in Maya 6, the adjustable parameters are what you would expect to see such as polygon count and angle limits with the ability to automatically generate multiple LOD (level-of-detail) models for use in a game engine. Each LOD can be individually tweaked though the automated features are still no magic wand so artists will still want to keep those low-polygon skills sharpened. The feature I was most excited by when v4.0 was announced is the new Custom Display Host (CDH) that lets you embed other applications into a window within XSI. This can be an application such as Adobe Photoshop, or a non-linear editing package, or your game engine. By making your game engine aware of the XSI object model it is possible to send data in both directions, allowing artists to construct and place models within the game engine and then switch over to the game and fine tune the object parameters (or any other custom game parameters) that can then be sent back in to the modeller. All this without actually leaving XSI, which makes the application useful as a level editor as well as a modeller. CDH debuts in the current version and is still rough around the edges, I didn’t have as much time with XSI as I would have liked but this was the feature that had me sat up until 3AM most nights trying to integrate my game engine. I cannot describe it as a smooth ride though with persistence I was able to eventually get it to the engine to a point where it no longer took down XSI every time it exited. Yes, the problems most likely existed in my game engine, not XSI, but with the problems I had I would have to say that you should allow plenty of time for integration, don’t just expect it to happen overnight. The package really does absolutely everything you could want. Softimage has gone out of their way to accommodate game developers. The new pricing structure has brought it within the realm of many development studios as a possible alternative to the two major competitors. With the release of v4.0 Softimage has addressed the price comparison issue by making the package highly competitive. Softimage also offers very deep discounting for students & academics which changes regularly so is worth checking the web site for up to date information. Provides a Platform Developer Kit for connecting XSI to a Microsoft XBox. Better integration of workflow tools. Current release offers far more to game developers than ever before. The Custom Display Host feature still feels like a “v1.0” product. 2D painting tools are not yet up to the level of something like DeepPaint. Not as well supported by 3rd party tools & books compared to competing products. This review originally appeared in a 2004 issue of Game Developer Magazine.